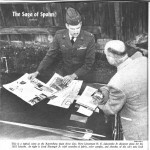 I’m honored to share an article with you today written by automotive historian and good friend Wayne Graefen. Wayne’s fascination with Spohn Customs has spanned nearly 50 years and culminated recently with the finding and acquiring the first one he had ever seen – so many years ago. 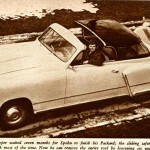 Wayne has offered to pen a few articles for us around the history of Spohn and their custom cars, and I’m pleased to share the first of what I hope are several articles about Spohn today. 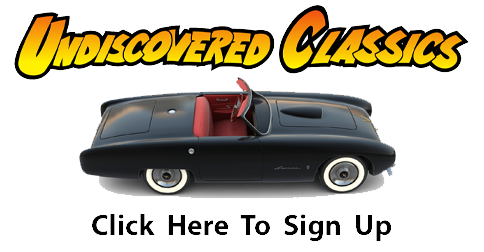 Readers of Forgotten Fiberglass come understandably from the point of view that a fiberglass body shell is bolted to a stripped down automobile chassis, drivetrain, electronics and trimming added and one drives away. There are even support stories of this being accomplished in a matter of days or a couple of weeks. The craft of the “coachbuilder” is more complicated. Let’s study the Herman Spohn Carosserie inRavensburg,Germany. AnyUSor other world coachbuilding firm would be much the same. From ’41 Packard to Spohn Custom for owner Lt. Arthur Cooper. The car survives today. First let’s give definition to “coachbuilding” in its two basic eras. Recommended broadened explanations available at www.coachbuild.com. Prior to WWII an automobile manufacturer might create a new running chassis sans any bodywork and send it to another firm for completion of everything chassis up according to the car company’s intent. Or the chassis was sent out for completion employing the coachbuilder’s custom creativity. Also possible was that a completed new car left the factory and the existing production body was modified to lesser or greater degree to the new criteria of the owner. The Hermann Spohn Carosserie in Ravensburg, southwesternGermany, was primarily in the business of supplying everything to be built on the chassis. Their primary contract was with the premier German firm of Maybach, a scant 11 miles down the road in the city of Friedrichschafen. The vast majority of Maybach cars from 1930 to WWII had Spohn livery. Similar scenarios existed with US companies though custom bodies were often spread among a broader number of coachbuilders. Post WWII the auto industry saw significant changes. Mass production had been institutionalized through the required pressures of war production and the automobile followed suit. Coachbuilders were largely left without commissions and many went bankrupt. Some morphed their war production contracts into re-formed business. Spohn, with their reputation as one of Europe’s premier body builders, fought the pressure and received some contracts for several years. Their largest potential was to coachbuild for the new Veritas performance cars built from pre-war BMW chassis parts but that company failed by 1953. We can’t know whether it was the manager of Spohn, Josef Eiwanger, Jr., who solicited the work ofUSservicemen occupyingGermanyto re-body their existingUScars or whether a first serviceman heard of the talent at Spohn and drove in as the hook on the chain of Customs which followed. Spohn eventually was without work and closed in 1957. We do know that at least two dozen US chassis cars were brought to the Spohn Carosserie and this is the process that ensued. The owner of theUScar had some strong idea of his own about what he wanted to see on his custom car. As a serviceman and a car guy, he would be a reader of any and everything he could get on new cars as well as the latest restyling trends from back home in the US. 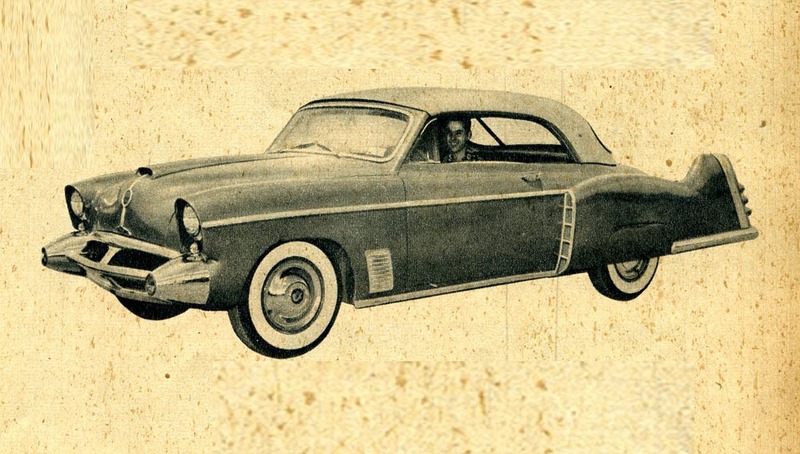 He was seeing bothDetroit’s concept cars and “little books” customs from sea to shining sea. We have one direct account from USAF Major Jack Chandler, Spohn Custom owner, of what happened next (1). In sum Maj. Chandler drove in, laid out drafts and pictures on Herr Eiwanger’s desk with circled features on each and challenged him to create a composite in blueprint format. Eiwanger replied that greater detail and discussion would be required and five hours of that ensued during which Eiwanger, an engineer and designer himself, would have attempted to influence the outcome. As we know, the finished product must reflect the fact the customer is always right, and that is the crux of modern hobby criticism of some Spohn Customs. A financial contract was struck and the car deposited with the Ravensburg firm. Time frame of a mere six weeks is given in this article for completion though other sources suggest construction times closer to six months so that was likely a misprint. Consider this: nothing whatsoever is “standard” when this contract is begun. The owner will make decisions way beyond the initial design elements he brought in the door. Creating this car was done from the Spohn “box of toys” (2). What materials would be used to make a grille and how would they be arranged? Were driving lamps desired and what form would the parking lights take? How many tail lamps and where? What would light up as stop light(s)? Eiwanger nearly insisted on engine compartment heat exiting the sides of the front fenders so what outlets would accomplish that and how would it blend to the body? Number and type of gauges for the dashboard and quality of radio and its placement? Leather samples books (it would have a 100% leather interior) were shown requiring a decision as well as whether monotone or two-tone (Spohn prefers the national colors Red and Black but it is your car) and the leather even covered the entire dashboard and windshield interior garnish. German square weave carpeting was to be installed in interior as well as fully lining the trunk. Minutiae like a sample case of interior door handles and window cranks invited inspection and it included those of the ‘30s Classic Horch cars. 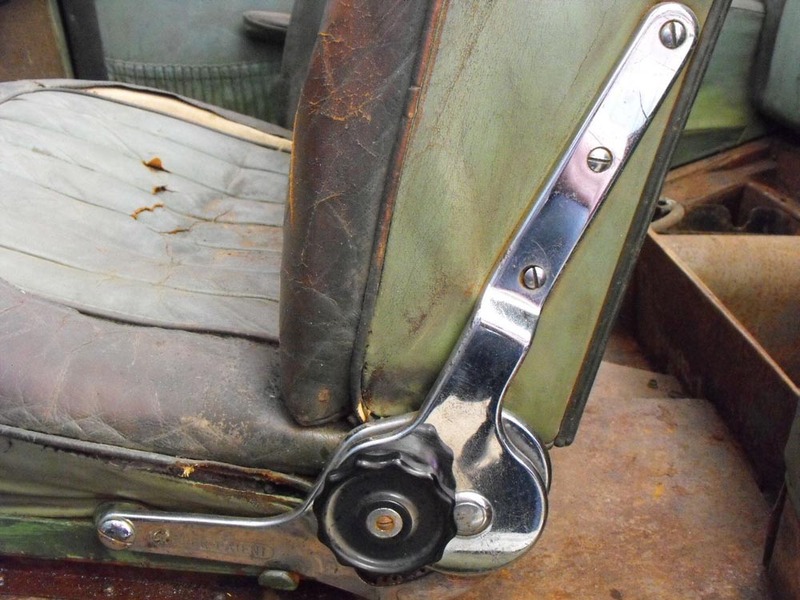 For a few dollars more your front seat could recline through a then new mechanism from German company Keiper (which went on to purchase Recaro and in 2011 bought Johnson Controls). Body ornamentation was not going to be chromium because in that Korean War period, chromium was at a premium to near unavailable for the purpose, so aluminum would be used including the Sabre statement if so equipped. The car received new black sidewall tires as that is almost universal at coachbuilders. Did the customer like these Porsche exterior door handles or were the Volkswagen’s suitable? And the wheel covers came from the largest user of stainless steel in the world, Lyon Corp. near Detroit. Catalog and a few samples presented for choice. Owner had to choose colors for exterior and interior of course. Having received a running, driving complete car, the crew of the carosserie must disassemble the car down to the bare chassis. One principal sheet metal structural component will be saved in most cases and that will be the cowl assembly which will likely be trimmed in height and a new windshield frame component will be added. Very little if anything will be done to the chassis other than replacement of possible worn parts or suspension changes to result in a new finished stance. The real work is in translating the design to metal. First a tubular framework was engineered which was then welded to the frame to give foundation to the new sheet metal. A major undertaking; smooth transitional surfaces of design don’t just flow from fender to door to quarter panel. Supports for bumpers require forethought for strength and function. Doors must have hinges and windows and latches. Convertible tops need a well with hinge points. An uncompromising goal here was that a finished body by Spohn would be seamless, a factor easily lost on fiberglass car fans where the bodies come out of the mold as one seamless piece. Working in steel and creating individual panels without bolting one to another, but rather having every piece of immobilized bodywork have no visible connection to the next, is a great challenge. For a frame of reference, walk around any 1950s automobile; front fenders may be obviously bolted to a grille surround and they are certainly bolted to the cowl. The Spohn Custom is seamless. 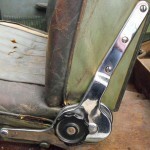 ‘50s rear fenders or quarter panel may be bolted to the main body shell; a Spohn Custom is not. ‘50s rocker panels will have a seam to the front fender and another joint at rear: a Spohn Custom has seamless transitions. Many West coast customs leaded over all these seams in the same period. Another of Spohn’s selling points was that they laid on the finest paint finishes inEurope. 14 coats of lacquer was their standard and this was back when the depth and beauty was enhanced by the material available being nitrocellulose lacquer, banned in theUSat this writing date for about 30 years. What did all this cost in early 1950s dollars? The lowest amount found mentioned was for very minimal custom work and of the cars and designs known this was likely on a ’50Pontiacconvertible. 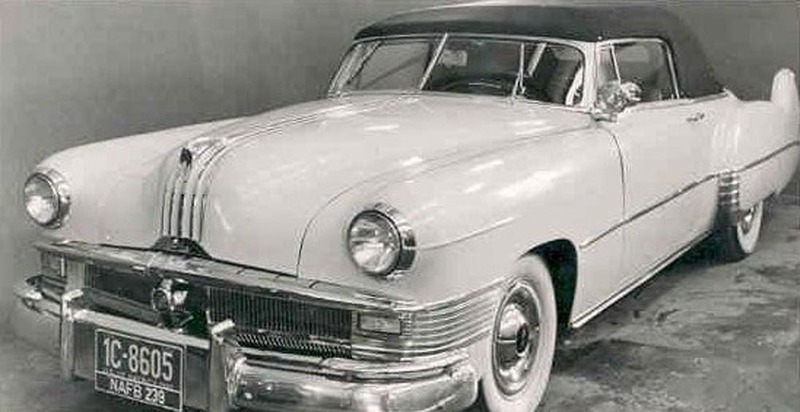 Apparent from its photograph are minor changes on the production grille, a more formal convertible top covering eliminating the quarter windows, Le Sabre fins (with rear center nacelle unlikely), and necessary repaint. This cost “a few hundred dollars”. 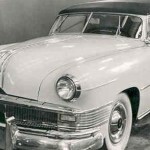 On the other end of the expense spectrum was a ’47 Cadillac convertible commissioned by private US-based owner Charles (Chuck) Justice. Costs involved shipping the Caddy from his state ofVirginiahome to Ravensburg, Spohn’s work, and US return. Grand total given as $14,000. No photos of that car uncovered as yet. 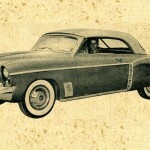 The typical Spohn coachbuilt Custom appears to have been in the several thousand dollar range topping out at perhaps $7,000 in 1950s dollars. That was more than a year’s salary for the customer demographic of a USAF flyboy. 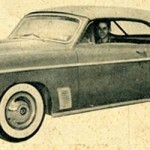 Spohn did not do “hop-ups”; any hot rodding was done after the customer took delivery and most likely after the car was shipped back to theUnited States. Most Spohn Customs appear to have received this additional investment in their early years. What happened to Hermann Spohn? The founder of the company had passed away at age 48 in 1923, a scant three years after founding the carosserie along with a partner, an excellent designer named Josef Eiwanger, Senior. The senior Eiwanger guided the firm through its glory days prior to World War II and kept it going with war production contracts. In 1950 Senior retired and handed the reigns to his son, Josef Eiwanger, Junior, who was both engineer and designer. Interestingly, as far as can be discerned, the Spohn Customs seem to have begun when Junior took the reigns. In 1957 the market for Spohn’s talents in Europehad evaporated. The workforce decreased rapidly, from 130 in September 1949 to 66 in September 1951 to 55 in August 1956 (3). One very late contract job out of Spohn was the re-body of a 1938, Maybach SW38 model into a limousine for Karl Wilhelm Maybach, the only man who had run the Maybach car company, a personal friend of Senior Eiwanger. Herr Eiwanger, Jr. took an engineering job with Mercedes Benz when the doors were closed at Spohn. The Spohn Carosserie has been gone over five decades. What remains is the handiwork of the many artisans had been employed. There are innumerable Spohn bodied Maybach automobiles in premier collections and museums around the world. Additional individual products on Hispano Suiza, Mercedes, Bugatti, Veritas, Rometsch and other chassis also exist. Our interest is the unique, sometimes outrageous Spohn Customs of the post-war period. The historical stories of these cars are now being written. Part of the original Spohn works today is used by the city of Ravensburg as a museum. 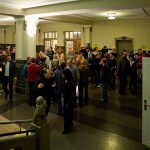 An unknown recent event is shown in one of the former work rooms. Is that Herr Eiwanger’s table on the left for drafting design blueprints? 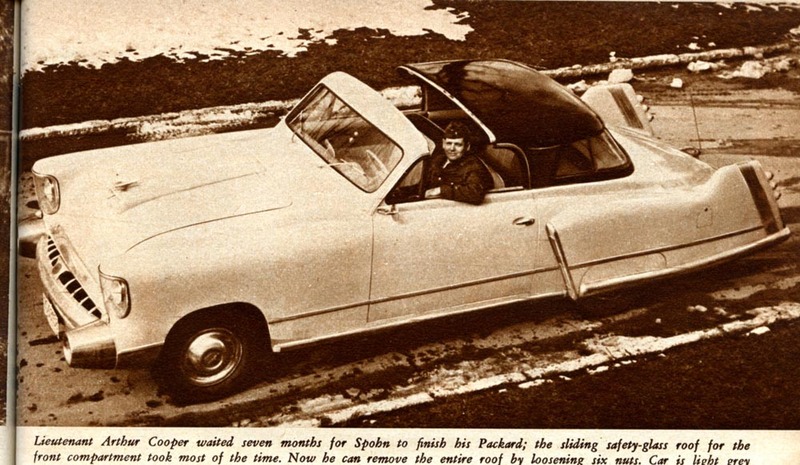 What a great review of the history of Spohn Coachworks, and our warmest thanks to Wayne Graefen – Spohn Custom owner and automotive historian – for sharing the article with us today at Forgotten Fiberglass. 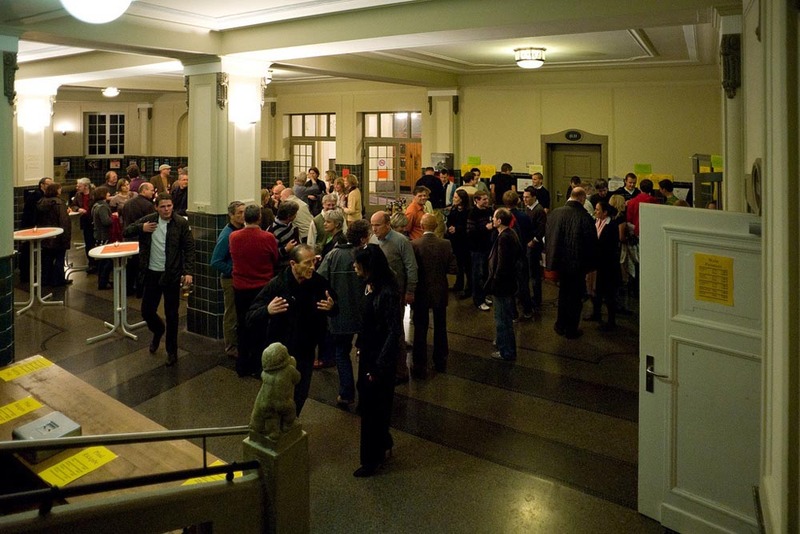 I have just recently heard back from Ravensburg that the room in the photo is part of a school which was donated by Hermann Spohn to the city, and is not actually part of the carrosserie where the cars were built. Wayne & Geoff – Thanks for a really great article – as Geoff knows, I’ve been a long time fan of Spohn coach built cars. The seamless body construction is not unlike that of Aston-Martin and Lagonda, which makes repairs a costly proposition, but they sure look terrific! This whole Spohn thing is very puzzling to me. Why would you send cars from the US all the way to Germany(I know some were already in Europe) to have this work done? They all mostly seem to have this tailfin design that any respectible body shop in America could handle with ease. And if it was such a craze why didn’t we see it all over in US, done by American shops, in car shows? Did any US serviceman have work done by italian craftsman,there was plenty to copy down there. There is something in that spohn tail fin design. I would love some inteligent answers. These cars were there generally because Americans were there, GIs, Diplomats, etc. These cars were shipped in free by the US government for those sent on assignment. Often when the tour of duty was finished they were sold to locals avoiding import duty. These cars would trade hands among Americans for low bucks. In 1963 I bought a 1948 Pontiac convertible for $85 in Japan. A friend that had been in Turkey had a 1949 Plymouth in 1962 and sold it to a Greek family for a basket of money. It was almost $3,000 when exchchanged. Most of the cars that Spohn Kustomized were worth less than $500 on the American market by the time they got to his shop. In the 1950s and 1960s even Sargents made 3 to 4 times the amount a local semi professional person would, hence it was spent on this kind of car. If they were returned to the US the insurance and repair costs would be far more than a military guy could handle, so few showed up in the US. Wayne, I really look forward to your follow up story. There is so much out there for us old guys to learn. One can only imagine some of the ideas that may have been discussed at meetings between Harley Earl and his good friend Batistta Pinninfarina. I own a 1935 Adler Trumpf Junior Sport with a Spohn Body. I received this car from my father-in-law in 1984 and have finally begun a total restoration. He purchased the car in the early 1960’s in NJ from a GI who brought it back to the US in 1954 from Germany. Any thoughts on how I might trace the history in Germany would be appreciated. The car was in the Landshut area in Germany. chassis number of the Adler I would be glad to investigate further. Raymond, I would like to see some photos of your Adler Trumpf. Please visit Spohn Custom Enthusiasts on Facebook. You are welcome to post photos there. Look for the blue Citroen bodied postwar by Spohn. Perhaps your car has a similar story. Thanks. I would like to send you some information about my Adler, but when I replied to your e-mail it was returned as undeliverable. Do I have your correct e-mail address?